"Hope is the thing with feathers that perches in the soul, and sings the tune without the words..." - Emily Dickinson. On my first day at Pandemonium, I met a Blue and Gold macaw named Beakman (whose affinity for love songs has endeared her to me in ways I can't express) and a neon body feather fell from her. It was shockingly yellow; I pocketed it as a secret treasure. While birds discard feathers as waste, these no-longer-needed gems that litter the grounds here are a gift to the humans who can appreciate nature's art. Feathers have fascinated me ever since I stumbled upon Thor Hanson's Feathers: The Evolution of a Natural Miracle. Smitten, I read it in two days, pausing only to begrudgingly attend my college lectures. 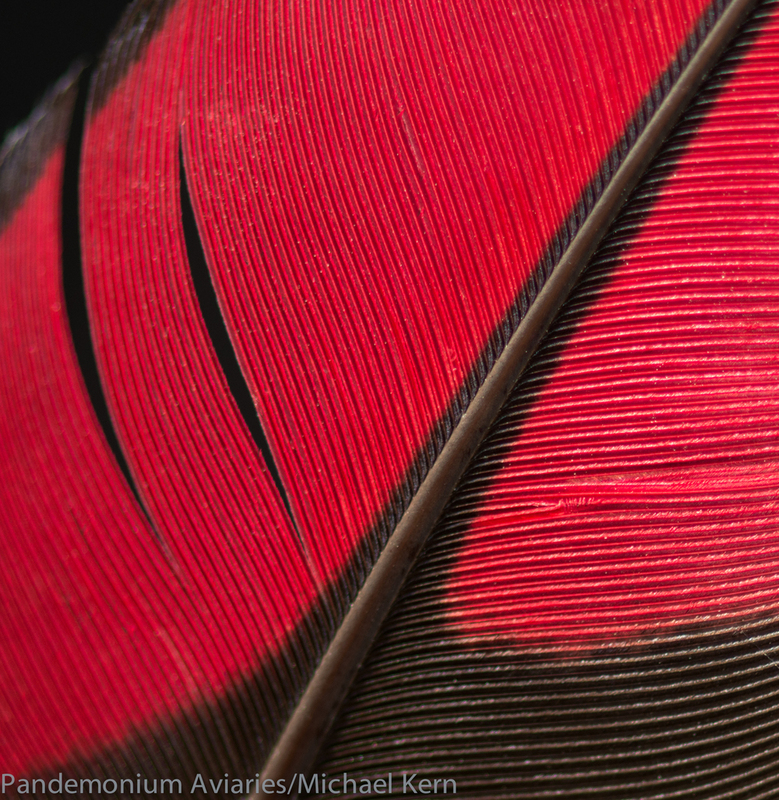 While the research and subjects covered were extensive, there was one fundamental but elusive question: what accounts for the colors of feathers? What causes the beautiful colors that you see on a bird like Beakman? Are the feathers truly blue and gold? The truth is that while the yellow is a pigment, the blue is not! In fact, most colors that we see in feathers cannot be attributed to pigmentation. So, if not pigment, then what is responsible for the colors we see in most birds? The answer is a bit scientific, but easy to visualize if you think of a soap bubble or a prism. When light shines on feathers, it is bent and shines back at the person looking at it. However, different structural arrangement within the feather influences how far back the light can shine and how it will interfere with other refracted light. Depending on the thickness of the soap bubble film or the properties of the prism, you can get different interference patterns. Similarly, depending on the structures of individual feathers, the color shades the bird could form are nearly infinite! Other colors are, in fact, examples of pigmentation (or a blending of pigments, or a blending of pigments with light interactions). Pigments come in three types: melanins, carotinoids, and porphyrins. Melanins are particularly useful pigments because they also increase the strength of the feathers. Carotenoid pigments come from pigmented plants that the birds are eating: because carotenoid pigments are usually bright yellow, they can mix with melanin pigments to make green shades. Lastly, porphyrin pigments are made through modifying amino acids. These are particularly rare. To better understand this, we can turn to Pandemonium's turacos. Turacos actually have two of these unique porphyrin pigments: one for green, and one for red. Even more fascinating, they have the only green pigment found in the avian world. To get you better acquainted with turacos, here's some quick trivia: they are medium to large birds whose feathers have been treasured by African folklore as well as chiefs and royalty. Their bird family Musophagidae literally means 'banana-eaters' while their diet actually consists of fruits, flowers, and small insects. They are endemic to sub-Saharan Africa, and they regularly live in forests, savannas and woodlands. While they are fairly weak flyers, they are extremely good climbers and prefer to live in treetops. They can live upwards of 35 years in a well-kept aviary. Their true green pigment is called turacoverdin, and has been shown to actually consist of two separate green pigments. Turacoverdin is mostly composed of iron and copper. Turacin, their red pigment, is a copper complex of uroporphyrin III. Turacin only occurs in wings, crest and nape, though it can be readily replaced by melanin, as exhibited on their backs. Because turacin occurs only in the presence of turacoverdin, they can be said to have a close chemical relationship. A popular myth states that turacin can be washed away with water, but the pigment is actually only soluble in alkali. In fact, the iron would cause the red to darken with water exposure! So fellow feather-keepers, were you to find one, you could keep it close (perhaps on the brim of a hat?) regardless of weather. And better yet, you could proudly boast the very signature beauty of the Musophagidae. Hanson, Thor. (2011), Feathers: The Evolution of a Natural Miracle. Basic Books, New York.